Baby’s first little tooth should mark the beginning of a proper oral hygiene routine. During the first few months of teething, you can clean gums and growing teeth by using our Teething gel and soft clean gauze. Once your baby can stand steadily on their feet – usually between the 8th and 12th month- you can start teaching them how to brush their teeth with a toothbrush. 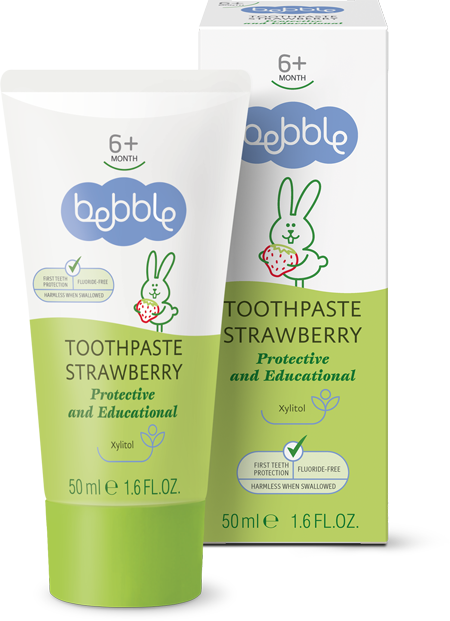 The low-abrasive and anti-caries ingredients of Bebble’s baby toothpaste gently cleans the first teeth. Natural xylitol prevents the growth of microorganisms and helps to strengthen tooth enamel. Our baby toothpaste does not contain fluoride, preservatives or colourants, which makes it harmless when swallowed. Children love the subtle strawberry flavour, and the paste can be used from a very young age in helping to establish a proper oral hygiene routine. Important: this product does not contain mint or fluoride, which makes it suitable for use in combination with homeopathic remedies. Apply a pea-sized amount of toothpaste to a baby tooth- or finger brush. Gently clean teeth, gums and tongue. Rinse with water. Close the tube well after use. Always make sure to use a special toothbrush, appropriate for your baby’s age. Look for brushes with a small head and thin bristles, and ergonomic handles suitable for small hands. A baby’s toothbrush, just like an adult’s one, should be replaced at least four times a year, or as per manufacturer recommendations. Always set an example for your child by modelling a regular oral hygiene routine. Initially, your baby will probably regard the whole process as a new and fun game; they will rub their gums, chew on the toothbrush and swallow the toothpaste. Do not let this put you off. Be supportive, patient and positive. As your baby grows and develops control over their swallowing reflex (around the 3rd year) properly brushing their teeth will have become second nature. Once your child’s permanent teeth start coming in, from about 5-6 years of age, you can introduce toothpaste with active anti-cavity ingredients. Until then, closely monitor how well your child brushes their teeth, help out when necessary, and use pastes with natural anti-inflammatory ingredients. This natural ingredient is found in nature in various types of fruits and vegetables. Xylitol reduces the growth of bacteria, thereby protecting against inflamed gums and tooth decay. 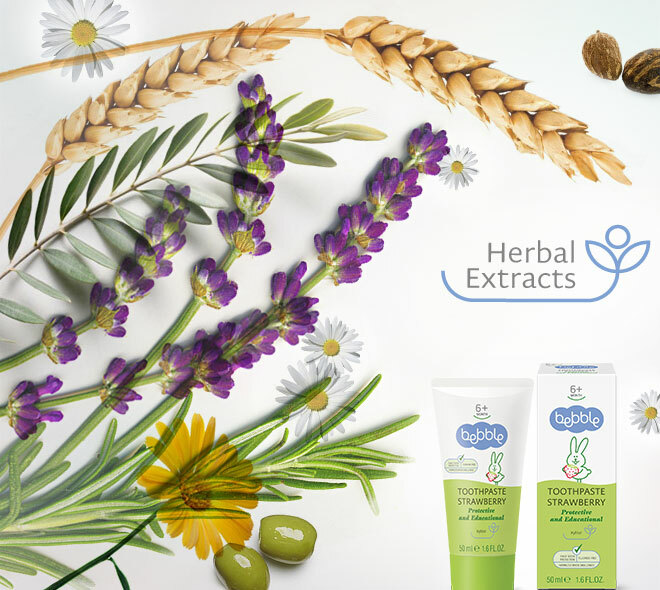 It helps to reduce plaque formation and enhances the remineralisation of tooth enamel. Apart from its antibacterial properties, xylitol is also known for its sweet taste.